A top-value, double-chain kick drum pedal - double the fun. Solid bass drum pedal that's ready for action. Top notch kick pedal at a friendly price. The Tama HP30 Single Bass Drum Pedal is inspired by the famous Iron Cobra range, using the same offset cam design, and it's affordable. Feel the speed, feel the power with a DW double kick pedal. 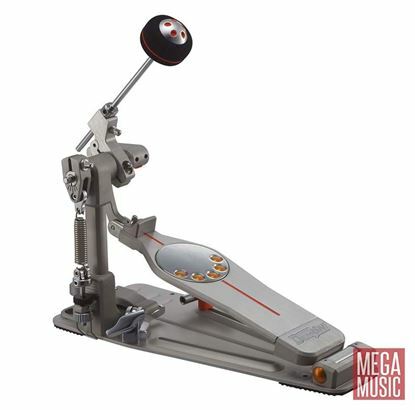 Fast flagship kick drum pedal from PDP. Fast, smooth, versatile and responsive. This one's a hit. Or rather, a kick. Pearl’s P930 Longboard Pedal merges many of the advanced features of our Flagship Demon Drive with our Award winning Eliminator line to create a bass drum pedal never before available in this price range. With the latest in kick pedal refinements, including Toe Clamp. The 9000 combines feel, speed and power. Who wants some? Feel the speed, feel the power with the flagship DW 9000 bass drum pedal.